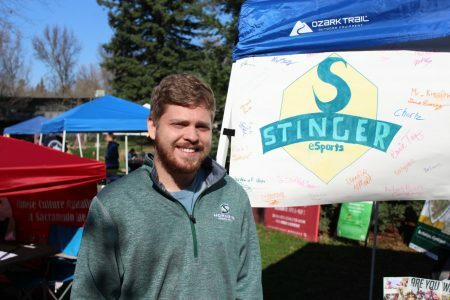 Stinger eSports, formed in fall 2017, is Sacramento State’s home club for casual and competitive players for a variety of video games. With the goal of creating a dedicated esports program, the club has competed in collegiate tournaments and formed partnerships within the esports industry. Its members want to do more than just compete, they want to turn Sac State into an esports leader. Nick “Draagslap” Palsgaard, a mechanical engineering major, is the club’s president and founder. He started the club after noticing that other schools have similar programs. Jose Fabian – The State HornetNick Palsgaard, president of the club, stands in front of the handmade Stinger eSports poster during club rush. Palsgaard started the eSports club in Fall 2017. According to UC Irvine’s esports website, it is the “first public university to create an official esports program.” UCI recruits and has scholarships for players in the program. Students in the program are also supported by a variety of staff such as coaches and managers. “If we start early, we can easily become one of the top schools,” Palsgaard said. Currently, Stinger eSports competes in the Overwatch Collegiate Championship operated by Tespa. As of Saturday, there are 456 teams competing in the Overwatch Collegiate Championship: National League, and the top four teams can win scholarship money.